Several companies tracked various aspects of mobile devices and shopping habits over the big shopping weekend last week. All sources agree that Black Friday had a bigger showing from mobile shoppers than Cyber Monday. According to data from AppsFlyer, Black Friday saw a 240% jump in in-app revenue from other Fridays in November. Android also showed a bigger increase in revenue than iOS. Android in-app revenue was up 58% on Black Friday over Cyber Monday, while revenue on iOS was up “only” 42%. Similarly, sessions were up on Android by 52% compared to just 15% for iOS, and installs were up 45% and 26% on Android and iOS, respectively. One reason for this trend could be that shoppers used their mobile devices while they were out shopping in brick-and-mortar stores, while Cyber Monday saw more at home and work getting their deals from laptops and PCs. Moovweb tracked 30 retailers in about eight different verticals. 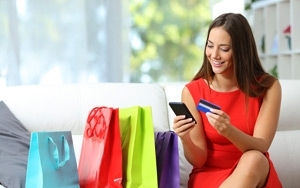 Its report showed a 45% increase in the number of shopping sessions and 16% increase in mobile conversions rates. Black Friday mobile shoppers drove a 95% YoY increase in mobile revenue. According to Moovweb’s figures, smartphone’s share of revenue grew 36% compared to last year. IBM Watson tracked mobile sales, noting that sales were up 30% over 2014 on Black Friday. 45% of total traffic on Black Friday, and 36.8% of traffic on Cyber Monday (up 70% from 2014) was accredited to smartphones, which were more popular for shoppers than any other device.